Straight Into A Storm centers around Deer Tick's 2014/15 10th anniversary run in New York City. A portrait of a hard rocking band known for their live performances on their evolutionary journey to becoming one of the greatest cult rock bands of our time. 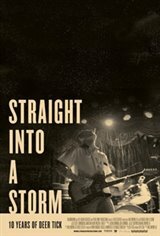 Anchored by a fan chosen set list and New Year's Eve performance, the film weaves in and out of time over the last 10 years utilizing never before seen archive footage from their early days to the successful touring/recording band they are now - and everything in between.